Do you find it difficult to say the word, “no?” I’ve met very few in my life, especially in ministry, who admit the word “no” slips seamlessly off of their lips. There’s something about the word “no” that just feels wrong or selfish. In many cases, it feels like the word “no” communicates weakness. While very few of us think someone is weak when they tell us “no,” (often it’s the opposite) we all have this rooted fear that by saying “no” we will appear not organized enough, not dedicated enough, or not strong enough. 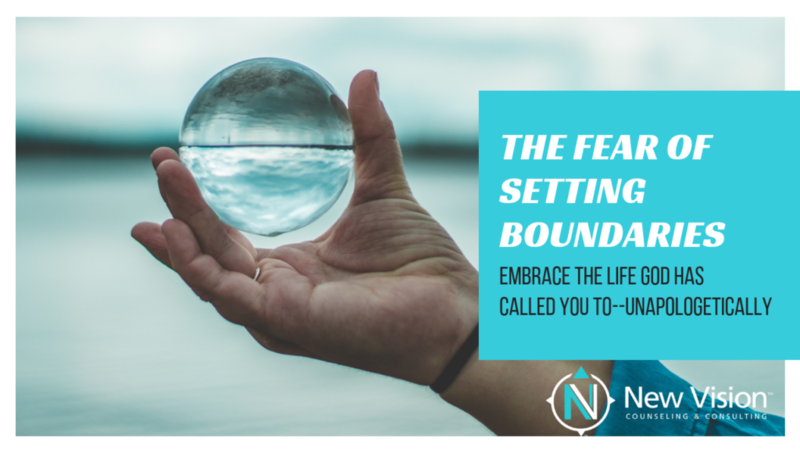 How do we fight this fear and start to view boundaries as an act of strength and health for ourselves and our relationships? If you sat down to list all of the tasks and people you are currently responsible for, chances are you might be a bit surprised by how many things are currently on your plate. If you’ve been feeling tired or worn thin lately and your list appears long, well guess what! You’ve found the culprit! It’s tempting to pack our days with so many responsibilities that we are spread too thin to do any of them well. Before we can create boundaries and remove items off of our plates, it’s important we take inventory first to become fully aware of the mental and physical loads we are carrying. It’s simple math--there is only one you, and only so many hours in the day--so the longer the to-do list, the less energy, attention, and time you can dedicate to each task. The problem is, some responsibilities can afford less attention and time, while others, such as your family or your relationship with God, can’t afford to be neglected. You may be familiar with the rubber or glass ball analogy. Consider each responsibility or task in your day as either a rubber or a glass ball. If the rubber ball gets dropped (work, laundry, golfing with your friends, etc) it will rebound and bounce back safely in your hands. The glass ball, however, cannot afford to be dropped (God, family, finances, etc) because it will inevitably shatter. Looking at the list of responsibilities you just made, consider which responsibilities are rubber balls which can be placed on the back-burner if necessary, and which ones are glass and should be made top priority. Don’t fall into the trap of feeling like you need to apologize for taking charge of the tasks God has called you to oversee. So what if your boss has a hard time understanding why you can’t work late every night when you have a family to go home to. At the end of your life, you won’t have to stand before your boss and give an account of how well you treated your wife, how much time you spent with your kids, or how well you led the family you’ve been entrusted with. You will have to give an account to God, though, so don’t feel the need to be apologetic to the call God placed on your life. Once you realize that saying “no” is an act of obedience to God, it becomes easier to see it as an act of courage and strength, rather than of fear or weakness. What is keeping you from investing fully into those responsibilities? What do you need to say “no” to this week?